The youngest daughter of acclaimed Iranian new wave director Mohsen Makhmalbaf, Hana Makhmalbaf, proves to any non-believers that talented filmmaking really does run in the family with her outstanding second feature film, Green Days (2009). By inter-cutting mobile phone and other amateur digital footage of shocking police brutality following the protests against rigged results re-electing the oppressive Mahmoud Ahmadinejad in Iran’s 2009 election with a series of hopeful pre-election footage, young Makhmalbaf offers a compelling and horrific vision of the extremity of a nation full of hope descending into a nation defiled and defeated. A far cry from ‘entertaining’ or ‘enjoyable’, Green Days is an appropriately and overwhelmingly distressing viewing experience. 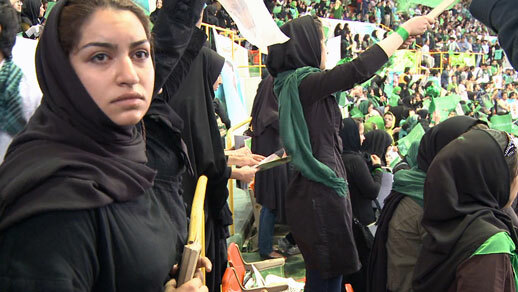 The film focuses predominantly on the lead up to the election in the country’s capital city, Tehran. A place that is home to some 17 million people and has been fighting for its freedom for 100 years, Tehran is described as “A city full of tears.” A continuous cycle of hope and deflation is subsequently expressed as both clinically depressing and infinite as, “Every four years we all get our hopes up…[then[ we lose everything.” Much of the documentary is informed by a young woman’s (Ava) disillusioned perspective through her search for medical help to ” Please stop this nightmare.” In a country where women can’t become president and where Ava’s work as a theatre director is politically banned, she is left to feel both politically and emotionally deflated. Proclaiming “Happiness is forbidden here”, Ava continues to work on her theatre pieces regardless, strongly reiterating the crime against humanity that is an endless cycle of hope (rehearsing) without victory (performance). Essential but not easy viewing, Green Days is a brave piece of filmmaking that everyone who considers themselves remotely humanist really ought to see.